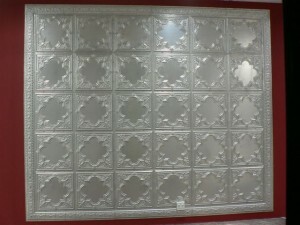 Antique ceiling tiles as wall decor is often not something that everyone thinks about. The above installation can be found in the Nelson Mandela square in Sandton City. When we were initially contacted to do this installation we were unsure of which method to use to cover such a large area on a wall. Normally antique ceiling tiles are nailed to wood beams on a ceiling or glued to walls. However on such a large surface we were unsure whether gluing would work. We then came up with the solution of using plywood for this project. The plywood was fixed against the wall with screws and the ceiling pannels were then nailed on to the plywood. This ensured that pannels remained exaclty as they should and delivered a very well rounded final product. 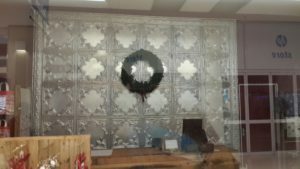 Unpainted or "silver" wall panels are one of our most popular products as they give a unique personallity to any room and are an instant focus point. The panels can be installed as above where you have a central pattern with a mold or frieze around. This can also be done with any number of other combinations. Our most popular product for antique ceiling tile wall decoration is the BNB04 which has been used in Vovo Tello and Cotton On stores around South Africa.